Are Birth Parents Given Money When They Choose Adoption? Most states have laws that state very specifically what an agency or hopeful adoptive family can and cannot give an expectant or birth parent. Any gifts must be of very little monetary value if they are allowed at all. When placing a child for adoption, a parent is required to sign legal papers stating that they have not been given money or gifts in exchange for their child. In some situations, an expectant parent may receive financial help during the pregnancy. In some states, agencies or couples adopting independently can help an expectant parent with basic food and shelter to ensure a healthy mother and baby. Even in these cases, there are strict limits on dollar amounts that can be given to expectant parents. Why do laws limiting financial compensation to birth parents exist? There are several reasons behind this. First, paying a woman to place her child is not adoption — it’s human trafficking. Making an adoption plan is done out of love and concern for the child’s well-being — not for a payoff. Secondly, even with legal limitations, financial compensation can be a form of coercing an expectant mother to place her child. If she accepts money for food or living expenses from an agency or adoptive couple during her pregnancy, she may feel unable to change her mind when the baby is born. Because of the money, she might place her child because she feels obligated to, even if it’s not what she wants. Thirdly, giving money to an expectant parent before placement is an easy way for hopeful adoptive couples to get scammed. It is not uncommon for a woman to pretend to be pregnant and agree to place her child with a family simply to get the money they would provide her for living expenses. Many hopeful families are more than willing to pay up to the legal limit, believing that they are truly helping the expectant mother of their future child, only to lose their hopes and money in the end. Birth parents never walk away with a paycheck after placing their child for adoption. 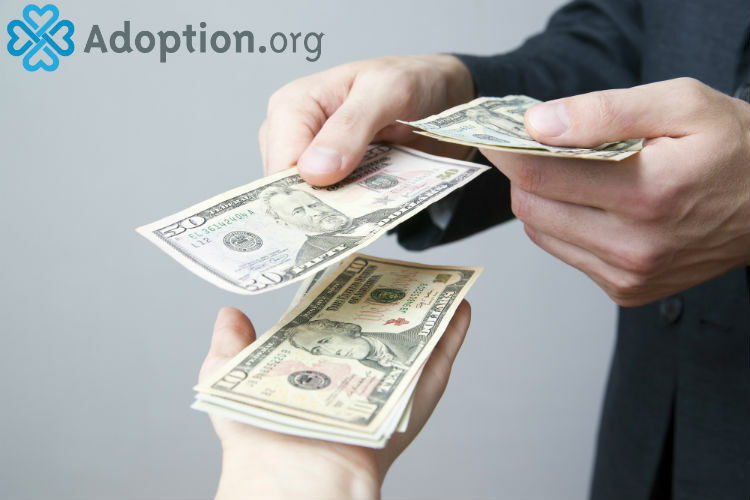 It is legally impossible to “get rich” off of making an adoption plan. At most, some birth parents get help with basic living expenses, and only during the pregnancy. Putting strict limitations on financial compensation is the best way to protect all members of the adoption triad.